Harriet Westmoreland did not expect to go into labour in the Harvey Nichol's men's underwear department! Nor did she expect that at exactly the moment she does she would set eyes on Alex Hamilton, and mark the start of a year of madness... For her, her family and, at times, it seems most of the West Yorkshire village of Midhope. 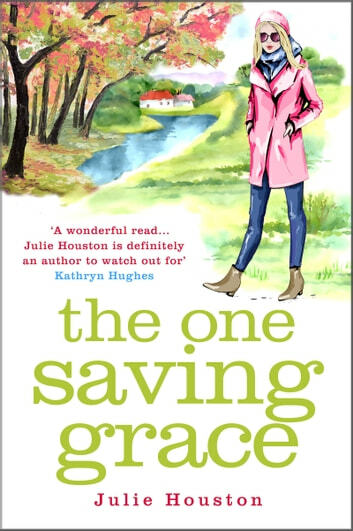 Warm, witty and wonderful, the unputdownable bestseller from Julie Houston is perfect for fans of Sophie Kinsella, Milly Johnson, Katie Fforde and Jill Mansell. 'Julie deserves to be up there with all the queens of chick lit' Alison Cremona. 'Superb story, great characters and thought-provoking happenings' Amazon reviewer. 'Reading this long awaited book was like meeting up with old friends' J.M. Jones. 'This sequel I have to say surpasses even the first book' Rani S.
'This is a fantastic book - pacy, sharp, and warmly and cleverly funny' Ysabel. 'A really funny and heartwarming book' Amazon reviewer. 'I could not put this book down, it had me laughing out loud, shouting at the characters and crying' Amazon reviewer. 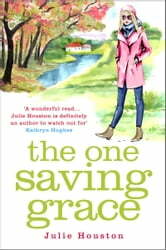 A fabulous sequel to Goodness, Grace and Me, I have completely immersed myself in this novel today. Continuing on from where the first book leaves off, we find a very pregnant Harriet going into labour in a department store of all places. With her best friend Grace due to give birth in two months' time, we following their lives, loves and relationships - and that of those surrounding them - in this riveting read. A change of fortunes may make life easier, but with two teenagers, a six year old, newborn twins and a husband who travels a lot - and I mean a LOT - for business, Harriet doesn't really have a lot of spare time; not even for her best friend Grace who seems to have her own worries. Wow .. what a book! There's never a dull moment with the main personalities as well as a non-stop parade of other characters. Whilst this one has it's funnier moments, there are some serious issues covered within the pages and it all adds up to a fabulous, sparkling read! I am so happy to have been able to read both these novels together; I have been completely immersed in the world surround Midhope and have loved every single word. Without rushing anything, all the matters raised were sorted out by the final page. Beautiful writing, well-crafted characters and a flowing writing style has just added to my enjoyment of this author's work and, as well as recommending this novel, I would be happy to endorse all of her novels. Five HUGE sparkling, shiny stars! The continuing adventures of Harriet Westmoreland. I requested this book and its predecessor at the same time on NetGalley, I liked the first book so I was looking forward to reading this one but unfortunately I did not enjoy it as much as the first. Just a short time ago Harriet was a teacher with three children, she and her husband were struggling financially, her mother in law was living with them and she was afraid that her old school nemesis/crush was trying to steal her husband. Now Harriet and Nick are financially secure, she has given up her job, she is about to give birth to twins and she is secure in the knowledge that Nick would never look at another woman. Her best friend Grace is also pregnant with her toy-boy Sebastian's baby, son of the aforementioned nemesis. But things never go according to plan, just as Harriet starts to emerge from the roundabout of children and housework and cooking she falls madly in love with the handsome Alex Hamilton (in Harvey Nicks of all places) and Grace gets a severe case of post-natal depression. This seemed to be almost the opposite of the first book in which Harriet was the poor put-upon, drown-trodden, overworked mother coping single-handedly while her husband is working abroad with a predatory, beautiful woman. In this book Harriet is a woman of, relative, leisure with a godsend housekeeper/babysitter taking all the pressure, she's selfish, reckless and frankly unlikable. I struggled desperately in the middle of the book, forcing myself past the need to DNF the book, I only read on because I was interested to find out what happened with Grace, even then I was disappointed. Although the book picked up towards the end for me the damage was done. I received a free copy of this book from the publisher via NetGalley in return for an honest review.